I've done my fair share of moaning about redundancies and dropping house prices and struggles since the recession first interfered with my own life back in August 2007 (when we tried to sell our Garnethill flat). But maybe the start of a new year is a time to look at a couple of positives it has brought. I feel that for the first ten years of my motherhood I was on a fast track, running from work to school, commuting, endlessly commuting. I needed to make enough money for the house, the car, the after-school care, the clubs, the birthday parties for the whole class, the hundreds spent on Xmas. Twelve years on paying for a divorce and to restart my life had almost bankrupted me, I started to slow down and realize what was important in life. I resigned, not to be a stay home mum - but to work in a less stressful manner. Now I work the hours my kids sleep, or when they are away at school. Working ten hours less a week, and commuting another ten less left me with twenty more hours with my loved-ones but no money less because I didn't need to pay the crazy nursery costs. It meant I didn't need to lie awake worrying where to put my kids on days they woke up sick or during the long summer holidays when the holiday club wanted £25 a day to look after each of them. I know I moan on nights I start work at 9pm and am still at the laptop at 2am because of a publishing deadline but that let's me bring up my family instead of leaving that to someone else so I also secretly celebrate it. I worry on weeks when I don't get any work, I worry on weeks I get too much but all in all life is better. When Thomas was told his level of management was being made redundant (when I was four weeks pregnant with Amaia) I probably stayed awake and cried in a panic for about a month. And when he decided to start a company from home at the worst point of the recession, I thought he was brave (but insane). But he did it and he now works from home. We can spend all day every day together sometimes just with the babies, usually with all the kids, taking part in everything we missed out on during the commuting years. Now my dad is ill, I don't need to beg a boss for time off to be with him, I am that boss and I can prioritize what is truly important. I love my life. We make less money but we've also realized what really matters. On the kids' birthdays the day starts with a nice breakfast with siblings and candles. Our five year old is actually happy with a birthday cake and three friends home after school to share it, happier even than being overwhelmed by 50 acquaintances in the town hall, with Coco the clown, jugglers and a face painter. Kids' birthdays don't need to cost £300 to make the kid happy. Xmas is the same. I look back at old videos and see my kids opening gifts for 30 minutes straight piling them up and then collapsing from exhaustion. Now they open three or four, get a cuddle and a kiss and look just as happy. If the business takes off and we go back to the earnings of five years ago or more, I will be thrilled to go back to long foreign holidays and a bigger house, but I won't be going back to the crazy parties or Xmases of the past, especially not if I have to sacrifice family time for it. I may not be able to afford a matching couch and armchairs the way I once could but I get to be with the ones I love. What could be more precious? 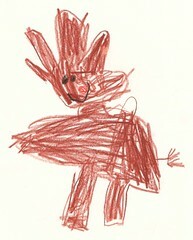 As the year changes and everyone is thinking of resolutions and wishes for 2011, I have only one simple wish for 2011. I hope to finish it the same way as I am going to start it in 5 hours time... with a wonderful dad. Keep fighting dad, we all love you! 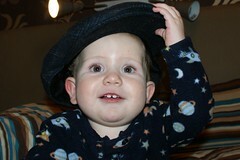 I got Thomas a hat for Xmas - the weather has been so cold recently. Amaia had a wee go of it today and I instantly remembered a very old photo of me taken back in 1968! Upstairs, we took turns to watch out as cars came round the bend and glided past the window at 30mph without their wheels turning. They'd hit the brakes and carry on all the way to the bottom. Various pedestrians shot past on their bums too - we even witnessed a four-man pile-up on the pavement! I am utterly amazed not one of our four cars was hit while parked there. 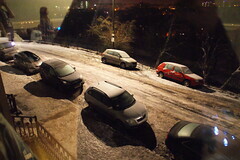 Obviously Glasgow City Council doesn't grit for anyone on Xmas day, whatever the conditions! I have been ribbing Thomas for weeks about his choice of shape for our traditional British Xmas cake... you don't get more German/Alsatian than a Kugelhopf. But I have to say it is the best Xmas cake I have ever tasted! It is so moist, full of good quality fruit and smoothly but lethally alcoholic. 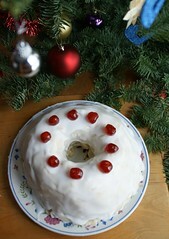 I have to congratulate him on his first attempt at a British Xmas cake (with a Germanic twist). I try to listen to the news in French every other night because our press is so insular - tonight's is particularly interesting. Even if you don't speak French compare the images journalists are being allowed to film (accompanied) inside Heathrow to those taken surreptitiously! Apparently tourists are being made to delete snapshots taken during their four day stay from their own cameras - that'll be bloody right! It seems to me that our priority here is how Heathrow looks to the outside world rather than making it actually work for the passengers. Typical of modern Britain. 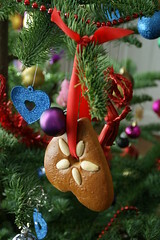 I don't suppose too many Glasgow Xmas trees have giant Lebkuchen hanging on them!? I wonder if I could get funding to give up the day job to do a PhD in teenage behaviour? They are truly fascinating creatures. Take yesterday: I tell Marcel (whose school is closed so he's out playing in the snow with two friends) to come home at 4-15 latest because the temperature was to fall drastically just after sunset. I couldn't go for him given my car is snowed in and he couldn't come by bus because the buses are also off in the snow. At 4-15 on the nose he rings and tells me he's warm inside Zack's house and I'm not to worry - he's accepted a lift coming back to our house but it isn't leaving till 7, but that's warmer and safer than walking. Ok - obviously I was speaking Chinese. Be home by 4-15 means take the decision to come home at 7pm and let me know at 4-15. What about dinner? I ask. Please just leave me something in the microwave - it is still more sensible to come home in my friend's 4x4 than walk an hour. Ok. Two minutes later the phone goes again - sorry the text goes 'Phone me mummy I only have texts left, no credit!' Oh oh, I know if he's using 'mummy' he's trying to schmooze me. So I ring and am informed not one but three of them are arriving at 7pm: Am I meant to leave three dinners in the microwave (that'll be bloody likely!) - we're running out of food Marcel, we're snowed in!? Oh no mum it's ok - my friends only eat kosher, I'll eat here then come. Good - that's one more meal for us till the snow goes! A reasonable exchange against two bowls of cereal this morning! Three kids turn up. Mine is at least in thermals. The other two (I kid you not) are in shorts(!!!!) and jackets. It is -14 degrees and they are in shorts! I am gobsmacked they are still alive. They all disappear 'to bed' at 11 and things are seemingly calm till rustling is heard outside my bedroom at 12-20am. I peek out in time to see Marcel and Leor passing with crisps and a tray of mugs. What's in the mugs? I ask - Coffee - how else are we going to stay awake? Why would they want to???? Teenagers - they look like adults but they really behave quite oddly. I associate my garden bench more with iced coffees in the summer months. I can't remember ever seeing it looking like this before! It's quite impressive, no? 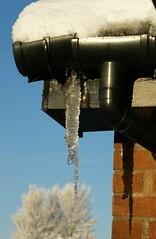 I don't know much about icicle formation (until 12 months ago I didn't live in a cold country!) 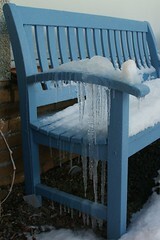 but I am more than impressed by the icicle that has formed just outside Charlotte's bedroom window. It looks like it has formed as a stack of narrow ice doughnuts - strange! Today the only way to get anywhere was by sledge. I dragged Léon and Amaia, while Lots dragged Anna. 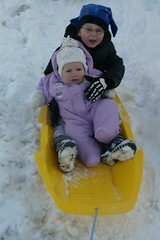 Léon did better than expected, only dropping her face-first in the snow once! 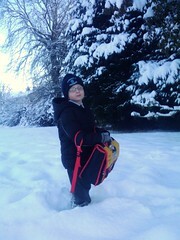 It is amazing quite how light they are on a sledge when the ground is this icy! I definitely found it less tiring walking up to mum and dad's today than I usually do when wearing Amaia in a rucksack and holding Léon and Anna by the hand. About a year ago Jessops were selling beautiful polarizer filters at about £45. I was lusting after one but it was so overpriced I just couldn't justify it to myself. About three weeks ago I noticed they had them on ebay at just £6. I ordered one, figuring I'd probably be done... but hey look at that blue sky! I am one happy snowbunny. André had promised to take the two oldest kids to school this morning as he hadn't seen them all last week because of the weather and his (extremely unreliable VW). He was picking them up at 7-40 for breakfast. At 7-45 Charlotte walked into our bedroom... not a good sign. Papa can't take us because of the weather, she announced. I looked out. It was pouring with rain and the roads were completely clear. I harrumphed and got dressed, muttering under my breath that I hadn't been shopping so didn't know what they could have for breakfast or lunch. 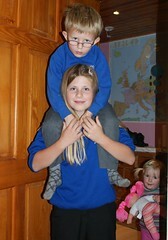 Poor Léon then needed to be dragged out of bed twenty minutes early because high school starts before primary. Out we went at 8-25 and we had a clear run up Crookfur road, Ayr road and Mearns road. Even Waterfoot road - on the summit of a hill in notorious cross winds was completely fine, just pouring with rain. Everyone was chucked out early and I cursed as I drove home via the post office to pick up a parcel. As I got out the rain turned to a flurry of snow with the largest snowflakes I have ever seen in my life - the size of oranges. Still I got home and had breakfast. An hour later I had lost sight of Thomas's car. By lunchtime I had ruled out picking up the shopping I had reserved at East Kilbride Argos! 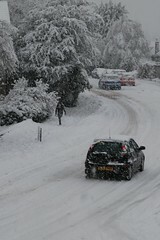 EK is a no-go area when Newton Mearns gets snowed in. I started to notice an eerie silence. The usual quarter hourly Harvie avenue bus service had ceased. Thomas and I were having a business meeting at 1pm when I started to hear a lot of voices. Kids in Eastwood and St Cadocs uniforms were walking up the middle of the road. Was the council evacuating the schools for the first time in my nine years as the parent of a school-aged child? I checked the school webpages. Both said School is open but please pick up your child as soon as possible. I dug out the car and tried to drive. Crookfur road was closed, or rather open but strewn with cars and buses. I tried Capelrig and got as far as the Ayr road. Within sight of the Broom shops I realized Mearns road had two buses blocking one side and two lorries blocking the other, I did a three point turn and abandoned ship. I walked up the middle of Mearns road between the abandoned buses. The silence was odd. There were no vehicle sounds, just the marching of many parents in wellies quietly trudging up the hill, interspersed with mixed ring tones and voice messages being played loudly. No one spoke as they went up. Everyone was trying over and over to contact someone on their phone. With Léon and Lots released, and Thomas manning the phone at home begging the high school to release Marcel with instructions on where to meet me and the wee ones (after 30 attempts at getting through on the high school switchboard), I made it back to the car. We watched a bizarre serious of cars each awaiting their turn to go onto the Ayr road, each being pushed up the last few metres by the occupants of the next car in line. I managed up without a push so felt quite smug. I got home two hours after leaving to pick them up, safe and sound. I see on the council web page they intend to reopen both schools tomorrow despite freezing fog. I will only be venturing out on those roads if they are safe. To get my kids I was prepared to drive, to send them out, no, sorry! In my 23 years of driving, I have never encountered such bad driving conditions (in this country) and most of the people out there haven't the slightest idea how to drive in snow! 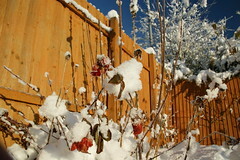 Since the snow began to fall last Saturday, one thing had been tinging the prettiness of it all with sadness for me. The knowledge that unlike every year for the last 25 years or so since Dad followed me down the path of amateur photography, we would not react to the first day of snow by ringing each other and saying 'Let's get out there with our lenses'. Since he started chemo a month ago, he's been out of the house maybe twice and given he had his big infusion appointment on Monday, I knew he would be asleep on his chair for the rest of the week. I would have to do my snowshoot alone, but somehow that didn't feel right. I didn't dare hope he'd manage out, the side effects of both his illness and treatment too terrible and numerous. On Wednesday morning the sky was perfect, so I decided I'd go out after lunch. Thomas was serving up lunch when I noticed I had forgotten something in the kitchen. I walked through and couldn't believe my eyes when I came face to face with Dad in my garden crouching in front of my igloo, camera in hand! 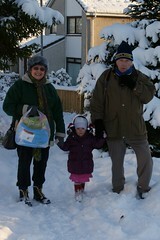 After warming him up with a coffee we managed a ten minute walk in the snow with our cameras. Previous years' shoots lasted many hours but those ten minutes on Wednesday were far more precious to me than the old ones where time was taken for granted. To quote Paolo, nowadays it's the simple things that mean the most to me. And like the father in his song, mine too has a family filled with generations of loving fans. Poor Amaia - every time I have taken her out in the snow this week she has fallen instantly asleep. It is all too much for her. So I walk about constantly listening to someone snoring in my ear because the buggy doesn't work in the snow. It's been a hard week with schoolruns (usually a 14 minute roundtrip) taking up to one hour in blizzard conditions. The school playground is now so deep that Léon is up to just above his knees in the snow - he is standing on the school path in this photo, snapped hurriedly on my mobile phone today. But everything is still running well. Hats off to East Ren council - they seem to be one of the few in Scotland who haven't chickened out and closed the schools - let's face it - this weather could stay till March and we wouldn't want the wee ones missing out on that many days of learning, even if they might rather be home building a snowman!